There are literally thousands of operators to choose from if you want to go on safari in Kenya. So who are the best ones? I have access to many travel diaries that are submitted to my African Safari Journals website and this allows me to see exactly who the good safari companies and tour operators are. This information comes first hand from people who have actually gone on safari in Kenya with that operator so it is very relevant and unbiased. I also (more about me) keep my ear to the ground in travel industry exhibitions, forums, newsletters and travel magazines to find out who the cream of the crop in the African travel business is. It wouldn't be fair if you were trying to rank safari companies to lump them all in the same category because they fall into three distinct areas based on the rates they charge for a safari trip. Low season rates can be about 25% less than high season rates. The rate indications below exclude international and inter-Africa airfares. Out Of This World: Prices range from $750 upwards per person per night spent on safari. Standard & Luxury: Between $350 and $750 per person per night spent on safari. Budget (camping where applicable): Up to $350 per person per night spent on safari. I've been referring people to many of the above safari companies for the better part of twelve years now, and their track records have been proven over time. They are all excellent at what they do but I've found over the years that some are stronger than others at certain things, so depending on your own unique safari requirements I can point you in the direction of the one that will be the best fit for you. You are welcome to contact each one directly yourself if you want, but I can save you some time and effort by making a recommendation based on your own situation, and then I'll ask that company to send you a no-obligation quote/itinerary. 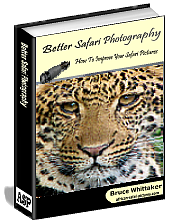 A free 41 page "Better Safari Photography" e-book containing over 25 years of my safari photo experience to help you improve your images on your trip. In addition, you also receive a comprehensive safari packing list, tips and advice section and a wildlife tick list.